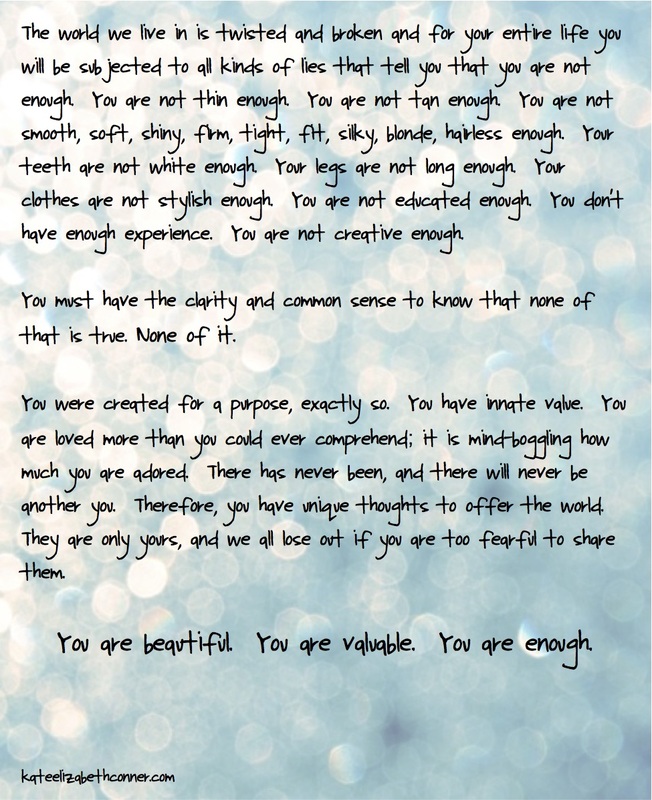 I read a beautiful blog post a couple of years ago by Kate Conner entitled Ten Things I Want to Tell Teenage Girls, and loved it so, so much. (Apparently a lot of other people did, too, because she has since published a book about those ten things– you can find it on her website.) The items on her list are– obviously– specific to teenagers, but number 10 can touch every woman’s heart, and there is truth for men in there, too. It certainly touched me. I actually printed a portion out and taped it up where I could see it every day. It’s easy to get down on ourselves, because we are surrounded by images or ideas telling us explicitly or implicitly what a successful human “should” be. We will fall short of those unrealistic standards every time. We can also get down on ourselves because we do legitimately mess up and make mistakes. But none of that cancels out the truth that each of us is wonderfully made with a unique purpose. One of my favorite sayings is, “Life does not have to be perfect to be wonderful,” because it’s so true! So much of life is a process, and the going is often slow or difficult, but that doesn’t mean it still can’t be wonderful. We should do hard things. We should speak up. We should share with others where we are at in our process. This week has been a mixed bag for me. Productivity-wise I accomplished some of the things I wanted to, but I also let myself down by putting off or neglecting some of my “to-do” items. While this week had some shining moments, I didn’t use all of my time as I should have. How about you? Were you winning this week, or left feeling like you can never catch up, or somewhere in between? I hope that these words will bring some inspiration to your heart like they do to mine, and that the weekend will bring some time for you to refresh and reset. Be gentle with yourself, but don’t forget that worthwhile accomplishments rarely come easily.